In Idaho, I grew up growing potatoes. It is a basic part of our diet as it is for many people in the world. 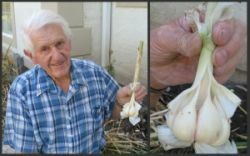 I can’t imagine growing a garden without this basic vegetable. You’re going to prepare soil for growing potatoes much like you would for the other garden plants. Add significant amounts of manure, mulch, and organic matter to the soil each year. This helps create soft, loamy, fertile soil. You can also add 16-16-16 fertilizer and elemental sulfur to the soil. Potatoes thrive in good soil. Rake the soil back to the center of the row after rototilling in the above mixture. See Types of Soil. 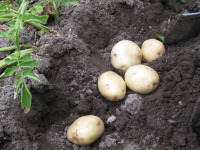 Plant the potato seeds about 5 days before the last frost in your area. 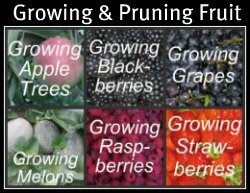 See Vegetable Planting Guide. Potatoes are a semi-hardy root vegetable. They are susceptible to frost but will come back from the potato tubers that are below the surface of the ground if they get nipped by the frost. I remember one year in Idaho it froze every month of the year (early July and the last of August). The potato plants produced a crop but the potatoes were smaller that year. Keep your growing potatoes watered and free of weeds. See Garden Watering Systems and Garden Weeds. Plant your potatoes in a different part of the garden each year. This helps to discourage disease and insect infestation. Rotating your potato crop inhibits the growth of wireworms. Wireworms develop in root vegetables like: onions, carrots, and potatoes. They also develop under ripening cantaloupe, especially if the soil stays wet. You can cut up some the potatoes that you have left over from the previous year or purchase potato seed stock from a nursery. Potato seeds are just potatoes that have started sprouting. About a month before you want to plant your potatoes, take some of your potatoes out of the pit. 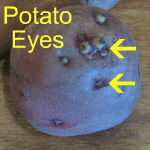 At room temperature, the potatoes will start sprouting from the eyes. Potato eyes are the little divots in a potato. Save your best potatoes to replant. The new potatoes will be in the image of their mother potato. If you plant the small, leftover potatoes; you'll harvest small puny potatoes. Cut each of your sprouting potatoes into 2 - 4 pieces. The potato pieces should be about 2 inches in diameter. Cut the potatoes so that there’s at least one eye in each piece. Most pieces will have a few eyes. The new plant grows and develops from these eyes. Let the newly cut potatoes sit for a day or two before you plant them. This allows the fresh cut areas to cure and toughen up a bit. You don’t have to dig a hole when planting potatoes, just step on the shovel and push it 5” – 6” into the ground, push the shovel forward, and drop a piece of potato behind the shovel. The potato seed is now in the ground 4” – 6” deep. Plant your potato seeds 9”- 10” apart. It's important to plant them deep enough. If the growing potatoes are too close to the surface of the ground, some of the developing potatoes will be exposed to the sunlight. 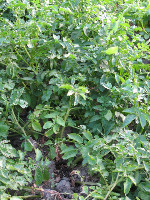 The potato tubers that are exposed to the sun will turn green and become bitter. You want to avoid this. After the young potato plants begin to grow, you can hill up the rows so that the developing tubers stay beneath the surface of the ground. When harvesting potatoes, dig up the whole potato plant. Dig a hole around the base of the plant that’s 12”-18” in diameter and about 12” deep. You don't want to chop the potato in half with the shovel. Remove the potatoes from the soil. You can dig up some of the growing potatoes throughout the summer so that you can eat them. Leave the rest of the potatoes in the ground until the final harvest in the fall. Harvest the potatoes in the fall after the first frost. The green part of the potato plant will die during this first freeze, but the potatoes that are under the ground won’t be affected. The ground acts as insulation and keeps them from freezing during the first fall frost. Your potatoes will stay fresh all winter in a root cellar. "Most homes are kept at temperatures between 65 to 75° F – much higher than the ideal storage temperatures for a potato (42-50° F). Potatoes contain approximately 80% water and therefore need to be stored in a humid location to prevent them from drying out. 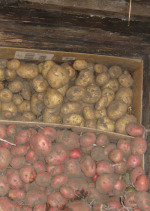 Storing potatoes in a dry place will cause them to become dehydrated. In commercial storage facilities, potatoes are stored at 90-95% relative humidity. (RH), but home environment are typically not this humid. If the potatoes are stored at a temperature of 32°-35° F, the starch in the potatoes turns to sugar. They won't taste like regular potatoes. Potatoes need to stay in the dark, moist, and cool. That’s why an underground root cellar or vegetable pit is the ideal place to store your potatoes. Having the pit outside keeps the potatoes cool. Having the pit in the ground keeps the potatoes moist. You’ll also need to add some insulation to the top of the pit so that the potatoes don’t freeze. Every couple of weeks you can go and get a bucket of fresh potatoes from the root cellar and put them in your garage. They only stay fresh in a cold garage for a few weeks. If your garage gets below freezing, you’ll need to cover the potatoes or bring them inside. Don’t let the potatoes freeze or they will get soft and mushy.